🏔🏐 WVB RECAP | The Cascades started slowly but heated up in a hurry, sweeping the College of the Rockies Avalanche in three straight sets! The University of the Fraser Valley women’s volleyball team shook off a slow start in emphatic fashion, defeating the College of the Rockies Avalanche in three straight sets on Saturday evening in Abbotsford. The Avalanche were the sharper team early, building an 11-5 lead to open the match, but it was all Cascades from there – they rallied to win the first set 25-21, and finished things off 25-16 and 25-19. Cascades fifth-year captain Kim Bauder led the way, leading the team in kills (14), digs (14) and aces (three) while posting an excellent 2.25 rating on serve receive. The two teams clash again on Sunday morning (11 a.m., Envision Financial Athletic Centre). 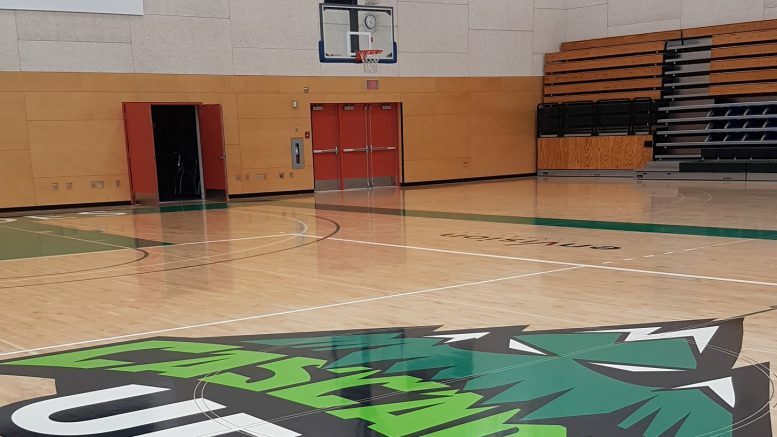 “We talk a lot about trusting the process,” UFV head coach Mike Gilray noted afterward. “We usually practice the day before playing, but the way the scheduled worked, we took Friday off this week. I think it messed with their timing a little bit to start the match, not having those touches the day before. After the Avalanche raced out to their early lead, UFV responded with five straight points behind the serving of Bauder to get back into it. Later on, five points from Keira Fisher’s service allowed the Cascades to surge ahead at 22-20, before finishing off the first set 25-21. The Cascades carried their momentum into the second set as they took a lead of 14-6 before cruising to the 25-16 victory. The story of the third set was the Cascades’ efficient hitting – Bauder and Alysha Cooper stepped up early with a number of timely kills, paving the way for the Cascades to take the deciding set 25-19. Left side Amanda Matsui chipped in with nine kills and nine digs for the Cascades, libero Karissa Marazzi had 13 digs, and right side Keira Fisher had 10 digs. The CCAA No. 9-ranked Cascades improved to 10-5 in PACWEST play, while the Avalanche fell to 4-12. 🏔🏐 MVB RECAP | Closely contested sets broke COTR's way, as the Cascades suffered a homecourt loss tonight. The University of the Fraser Valley men’s volleyball team hung around, but the College of the Rockies Avalanche capitalized on their chances to take a three-set victory on Saturday night at the Envision Financial Athletic Centre. After jumping out to a 9-6 lead, the Avalanche managed to outlast the surging Cascades 25-23 in a back-and-forth opening set. The second set opened with the visitors continuing their momentum, as the Avalanche’s Mark Armstrong went on a four-point service run to give them an early 6-2 lead. However, the Cascades would make a push late in the set off of a four-serve run by Shubdeep Wander to even the score at 22-22. UFV took the lead 24-23, but were unable to capitalize on set point, leaving the door open for the visitors to take it 27-25. The third set was once again tightly contested, but with the teams even at 21-21, the visitors gained the upper hand to close the match out at 25-21. The Avalanche improved to 7-10, while the Cascades saw their record drop to 1-14 on the season. The two teams meet up again to complete the weekend series Sunday at 1 p.m. at the EFAC. The Cascades’ Wander, Ben Friesen and Jackson Obst tied for team-high honours with five kills apiece. Gustavo Bertoli led the Avalanche with 12 kills, followed by Caleb Peters with nine. Donen noted that the turning point of the match came at the end of the second set. With UFV up 25-24, Landon Uy blocked an Avalanche attack, and the ball appeared to be headed for the floor. COTR came up with an unlikely dig to extend the rally, won the point, and ultimately won the set. Be the first to comment on "UFV Sports Saturday – Men’s Hoops In Playoffs, Volleyball Vs Avalanche, Rugby"